You are here: Home / branding / Why do you need more than one headshot? Why do you need more than one headshot? Most professionals are catching onto the fact that they need professional corporate headshots if they want to be taken seriously in Sydney. Most request a single headshot, but they generally leave with several. Why is that? We all know that a professional headshot is important to be able to convey the right message to your clients. But often your audience changes depending on where your headshot is being viewed, and thus the expression must also change if you want your message to be most effective. This is where the advice of an experienced Sydney headshot photographer can help. Let’s take a real estate agent for example. Of course you want people to find you honest, trustworthy, and competent. You’re dealing with their largest asset after all. But it doesn’t have to end there. Those are probably the exact same qualities your competitors are also trying to express, so to stay ahead we would help you craft more targeted messages. Your client demographic may be different depending on whether you’re selling beachfront properties in the Eastern Suburbs, houses in leafy North Shore, or units in the Inner West. How you position your image could also differ slightly. It’s not limited to what you’re selling For example, in a professional setting like LinkedIn, your viewers are likely to be other business people. Not everyone looking at your profile is looking to hire you directly. There may be a buyer’s agent looking to make a connection. There may be a mortgage broker needing to refer their client. It tends to be a more formal setting, so you would use a more formal headshot with good eye contact. Now your website on the other hand has a different audience. Someone has found your website and clicked on the About Page. They are already interested in your service, and want to know more about you. Specifically why you and not someone else with the same qualifications. You want to make a connection with this potential client so that they stay on your website and follow the call to action. In this case a more friendly headshot would work well. The key here is to have these different expressions that look like they come from the same session. If someone saw your LinkedIn and then your website, they recognise your headshot from both. They start to feel a connection with you when they see you are friendly and approachable. Maybe they don’t even consciously realise the two headshots they saw were different. Now they are much more likely to call you than a competitor. Once upon a time a headshot was a head and shoulders shot that you may have taken at the same place as your passport photo. Luckily we are no longer constrained to specific shapes and sizes. One of the most effective methods to gain more enquiries is to have your photograph on your contact page. As a small business, your viewers don’t know whether you are a real business or a call center in Asia. Instead of the map or the generic girl with headset, what if you were actually on that page, next to the contact form? Show that you are waiting and excited to hear from them! Wouldn’t that give your viewer a bit of confidence that you were actually going to read their message? That may be the little push they need to put in the effort to fill out the form! What about the next time you have a promotion? Instead of using the same stock photo girl who’s being used in ads for a hundred other businesses, how about stepping out there and being seen? Whether it’s an open house billboard, an online ad, or a printed flyer, you can use your branding photographs from the same set in many ways. Show that you are confident in your service, and that you are a real person, ready to provide real service. Suddenly you’re no longer competing on price, but people are seeking you out preferentially. And because all of these photographs are created consistently, they reinforce your brand each time someone sees them. Your message is consistent, therefore you are seen to be more trustworthy too. Wouldn’t that make business easier to discuss? It is said that clients need to see your brand 20 times before feeling familiar with you. If they see the same shot over and over again, they’re likely to grow tired of you before that happens. You need a way to be different enough to keep interest, and consistent enough to develop trust. That is where our experience can help. Be the best in your field. Our headshots are so easy and effortless, you’ll wonder why you didn’t do it earlier! See what Andrea had to say about her experience. Valent Lau Photography provides Professional Headshot & Branding Photography in the studio in Coogee or at your business location. Contact us now and let us help you make your best first impression. Get 6 Pro Tips to Make Your Business Stand Out from the Crowd! Being professional means looking professional. 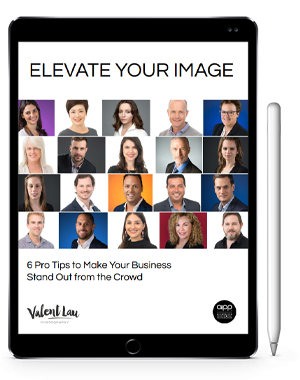 Take care of your image so your clients gain confidence in you… Get this free booklet with tips on how to always look your best and be seen as a leader in your industry, guaranteed! I hired the services of Valent Photography for my my bookkeeping business to use in my website, Valent carried out the project in the most professional way and was very patient. I thought it would have been very difficult for me to be in front of a camera but Valent's qualities & experience made me feel at ease each step of the way. What I was most impressed about Valent was his approach in getting me to think about what is important about my business and how I would connect with my clients. Excellent service with even better pictures. Really enjoyed my first professional photo experience. I would highly recommend. I've been needing to get some photos done, but it takes a while to get the courage up to get in front of the camera. But the day's been really really useful. Very step-by-step, easy-to-understand. I had a good explanation of what I wanted the photos for and how we were going to get the right photos for my LinkedIn page and for my different pages on my website, business cards. The photo shoot was really easy and a really good process afterwards going through all the photos and choosing what was right for me.